Who is Andrea Bern? When her dippy therapist asks the question, Andrea knows the right things to say: she’s a designer, a friend, a daughter, a sister. But it’s what she leaves unsaid—she’s alone, a drinker, a former artist, a shrieker in bed, captain of the sinking ship that is her flesh—that feels the most true. Everyone around her seems to have a different idea of what it means to be an adult, though. But when Andrea’s niece finally arrives, born with a heartbreaking ailment, the Bern family is forced to reexamine what really matters. Will this drive them together or tear them apart? Told in gut-wrenchingly honest, mordantly comic vignettes, All Grown Up is a breathtaking display of Jami Attenberg’s powers as a storyteller and a whip-smart examination of one woman’s life, lived entirely on her own terms. 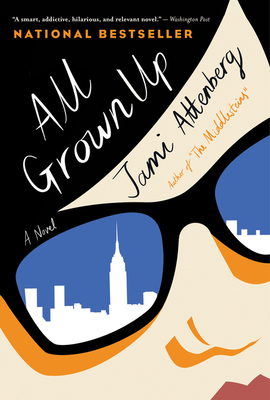 JAMI ATTENBERG is the New York Times best-selling author of seven books of fiction, including The Middlesteins and All Grown Up. She has contributed essays to the New York Times Magazine, the Wall Street Journal, the Sunday Times, and Longreads, among other publications. She lives in New Orleans. “Hilarious, courageous and mesmerizing from page one, All Grown Up is a little gem that packs a devastating wallop. It’s that rare book I’m dying to give all my friends so we can discuss it deep into the night. I’m in awe of Jami Attenberg.” — Maria Semple, author of Where’d You Go, Bernadette?